For over 60 years, Colletti’s has been a proud family-owned Chicago Italian restaurant offering the finest cuisine at the best price. Our world-famous thin crust pizzas have been a staple of our menu for decades. Whether you’re looking to dine in, take out, or get Jefferson Park pizza delivery, Colletti’s pizza has never disappointed. Available in individual sizes, family sizes, and large sizes for events and catering, you’ll agree that Colletti’s offers the best Chicago pizza delivery in town. Place an order for Jefferson Park pizza delivery now! Each of our famous thin crust pizzas is hand tossed and prepared with the finest ingredients. With one bite, you’ll soon be hooked on our Chicago pizza delivery! Using classic, authentic Italian recipes, our delicious pizzas are available in four different sizes and can be made to your taste using any (or all!) of our nineteen fresh toppings. Gluten free pizza is also available for patrons with gluten allergies. 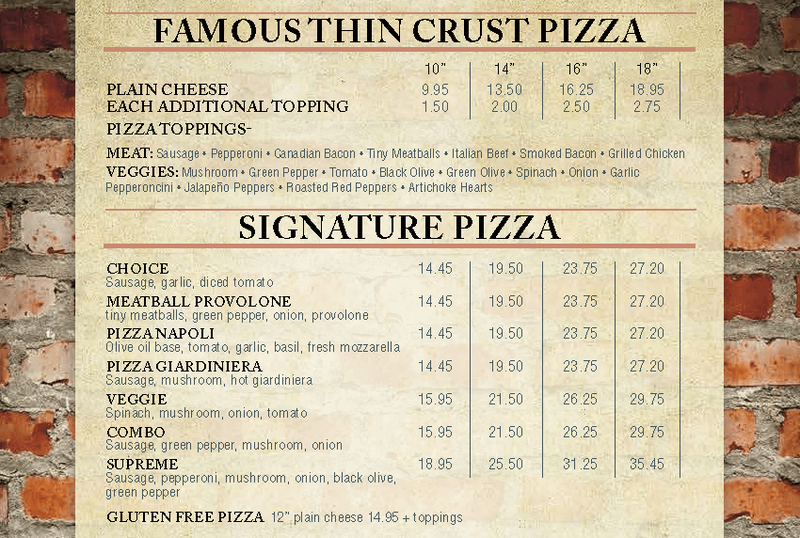 Our Signature Pizzas are our most popular Chicago pizza delivery. Made from scratch using our most classic recipes, these favorites are sure to please anyone for lunch, dinner, or your next event.